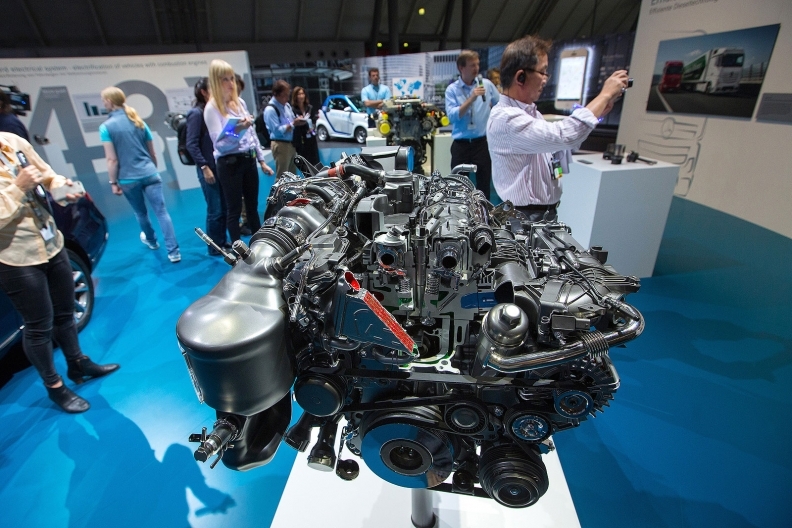 An all-aluminum 4-cylinder diesel engine on display during Daimler AG's TecDay Road to the Future event in Stuttgart, Germany, in June 2016. Mercedes-Benz Canada says it has given up hope of selling several of its 2017 model-year diesel-powered sedans and mid-sized SUVs “for the time being” because it’s taking too long for them to be approved by U.S. and Canadian authorities. “For reasons of product strategy, we will not be offering diesel versions of the C class, E class and GLC in the NAFTA region, for the time being,” Mercedes-Benz Canada spokeswoman JoAnne Caza said in an email to Automotive News Canada. The approval for the trio of models is taking longer due to a tougher vehicle inspection processes in response to the Volkswagen diesel emissions scandal. In November 2016 Mercedes-Benz Canada was the first company to report that 2017 vehicles were being delayed up to two months due to more intense scrutiny from the EPA. “It’s not up to speed. I wish it was behind us,” Mercedes-Benz Canada President and CEO Brian Fulton said about the certification in a telephone interview. “We’re still awaiting certification for our V6 engines. That’s really about the extent of what we can share. There’s no news and we’re waiting and we’ll see what transpires. Mercedes-Benz is still hoping for quarter-three certification for the GLE, GLE Coupe and GLS SUVs. The EPA will not comment on the status of preproduction vehicles until manufacturers introduce them into the market place and ECCC will not comment on possible delays in the issuance of certificates of conformity in the U.S.
“These investigations have a considerable impact on new diesel certification projects, both in terms of effort and duration,” she wrote. The EPA said in September 2015 that it would review all U.S. light vehicles with diesel engines following an admission from Volkswagen AG that it had installed software in vehicles that allowed them to emit up to 40 times the legally-permissible level of pollution. Dean Rideout of Langley Mercedes-Benz in B.C. said he’s making the best of the situation. He said the automaker’s plug-in hybrid offerings are actually more fuel efficient than the diesel engines. He has been offering the hybrid versions of the S550 sedan, GLC350 midsize SUV and GLE550 full-size SUV. Rideout said the first GLE550 buyer drove 1,800 km on his first two tanks of gas. “Sometimes, you have to let go of what we used to do in the past and accept what we’re going to do in the future. The plug-in hybrid is the next wave of efficient operation,” Rideout said.